Fiction is created. Ann Lislegaard blurs this notion in her most recent exhibition at Murray Guy, by picking on and blunting the common form of science-fiction. Science-fiction’s alternate mode of reality, its “other” universe, become metaphors for the gallery space. As Lislegaard picks on characters and sounds of science-fiction, she seems to be taking apart the very rooms she is currently occupying. Senses of occupation and deconstruction are articulated in the immediate split upon entering the gallery—there are two rooms on two sides, hosting two different works. The two rooms in Ann Lislegaard’s most recent exhibition at Murray Guy reveal an exciting tension between two opposing, contradictory yet complementary modes of working. The two rooms, to the right and left of the entrance, deeply influence the affect of the exhibition, through the order in which they are viewed. The room to the right, TimeMachine, hosts a fox-like creature that is projected onto a mirror. 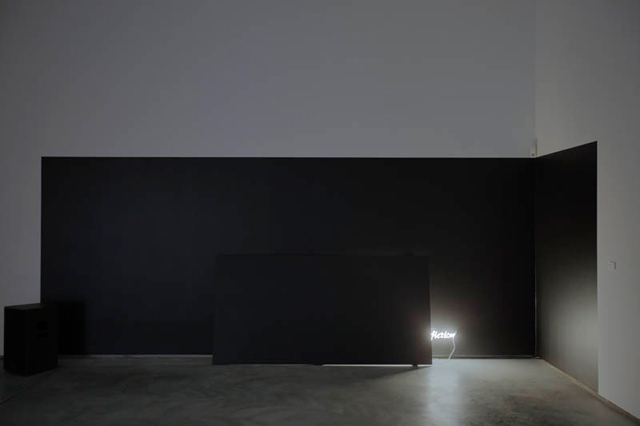 The mirror projected on is only one of the mirrors interconnected and positioned at seemingly vertical angles to each other. The chain of mirrors acts more as an architectural disruption than a structural support for the narrative. The visual effect of “two” creatures relaying this fragmented account is merely interesting; the architectural intervention seems like an afterthought that works in addition to, not with, the narrative. The room to the left, Science Fiction_3114, is a more sophisticated manifestation of the idea of architectural disruption; the sound from the few speakers on the floor — derived from science-fiction films such as Alphaville and Fahrenheit 451 — trigger an ominous suspension of disbelief, similar to the experience of reading Ursula K. Le Guin’s The Dispossessed (1974) marked by the eerie, the subtle and the self-reflective. The added leaning wall partially obstructs the neon sign “science fiction”—the word “science” is not visible. The floor creaks; the dissolution between the muted experience of this room and the very gallery space that the installation is in is the exhibition’s tour de force. Posted in content, on artists and tagged Alphaville, Ann Lislegaard, Fahrenheit 451, Merve Ünsal, Murray Guy, New York, The Dispossessed, Ursula K. Le Guin. Bookmark the permalink.